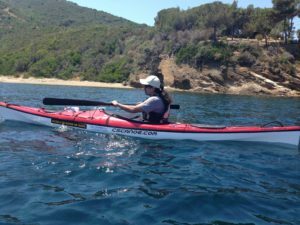 Holman Prize winner Ahmet Ustunel says the water is his “happy place.” Hear all about his plans to be the first blind person to independently kayak from Europe to Asia… alone! Plus the water being my Happy place means Ahmet and I have at least two things in common. not mandatory in my house, but I do want you to be comfortable. Let’s get it! All aboard! In this second of our three part series, we’ll meet another winner of the Holman Prize. The prize is named in honor of James Holman. Known as the Blind Traveler, Holman completed a series of solo journeys taking him to all inhabited continents. Ahmet Ustunel Our featured Holman Prize winner today like James Holman, is quite comfortable on the water. I spoke to him via Facebook Audio while he was at home in San Francisco. Retinoblastoma, is a rare childhood eye cancer that usually affects children before the age of years old. By rare we’re talking about seven thousand children a year. around 90 percent with significant children losing sight. In under developed nations, the rates are reversed and children’s lives are lost. white reflection in a child’s eye resembling that of a cat’s eye reflecting light. Early diagnosis and treatment are key to saving both lives and sight. were out of options to help. One of my relatives was in Germany working at a children’s hospital as a janitor so my Gran Ma took me there and they treated me there with radiation an enucleation. Enucleation or the surgical removal of Both his eyes, Ahmet returned home to Turkey now as a blind child. I was lucky in terms of having really supportive people in my family. I grew up in a really big family. Everybody had a different approach in terms of blindness. I was the only blind person in the family and even in the town I guess. I didn’t know any other blind person. Wow! How big of a town are you talking about? Maybe like ten fifteen thousand people. Then I moved to Istanbul which is like fifteen sixteen million people and that actually changed my life. Ahmet was aware of the contrasting dynamics in his family as it pertained to his blindness. Some were over protective while others wanted to help him do the things other little boys were doing. Ride a bike, tie hooks on a fishing line… avoid Sting Rays when you are swimming. These early lessons in the ability to make something accessible played a role in his education and future. After not being accepted in a mainstream school , Ahmet watched as his peers went to school at around 6 years old. Moving to Istanbul his parents tried to enroll him in the only school for blind children. With a waiting list Ahmet wouldn’t begin until he was 8 years old. Attending school during the week and returning home on weekends, Ahmet credits this school with teaching him valuable life skills. After 5th grade he would attend a mainstream school. They send you back to mainstream school with no support. So you go back to school with no books and no teachers for the blind. I was the first blind student in the school. I had to prove myself as a blind person. At an early age, Ahmet took his education and future into his own hands. I was walking around with my Walkman and asking everybody you know, can you read me a page or two. So you were basically learning to advocate for yourself at that young age? Oh yeah I mean absolutely I mean there was nobody to advocate for me. I will just withdrawal myself. Ahmet when on to not only prove himself to the administration but gain the confidence in his own abilities. He studied Psychology in college where he met his wife, a US exchange student. When I was in high school my school campus was right on the water, you can literally jump into the water from the campus. So is that where the kayaking came in, from high school. No actually I did a lot of you know water related activities since my childhood as I grew up by Black Sea. When I was in college I use to go rowing and stuff, but I haven’t started kayaking until I came here. A Kayak is a very narrow boat like vessel. You steer and move the kayak with a paddle that has a blade on each end. They average about 25 to 35 inches wide and 12 to 19 feet in length. So let’s say you have a kayak nineteen foot long and twenty eight inch wide. You can go really fast but it will be a little tippy. If it is twelve feet long and thirty five inches wide it will be really stable but you will go half as fast as the nineteen foot one. It’s made of either corrugated plastic or fiber glass, there are some inflatable models. your hand your right there the water is right there. So you’re like maybe four inches above the water. And you have a spray skirt which covers the kayak. So if you have a splash water doesn’t get in and if you flip over you are upside down but know water gets in. So you have to pull the skirt off the kayak and get out of the kayak and flip it over and get back in. Or you can do the special row it’s called Eskimo row. Without pulling the skirt off you can flip the kayak back and keep paddling. If you go paddling in cold water like San Francisco the water temperature goes below fifty degrees most of the time. So you don’t want to stay in that water more than 15 minutes. If you stay more than 15 minutes they say Hypothermia kicks in. So what does Kayaking have to do with the Holman Prize? You’re listening to Ahmet’s Holman Prize Ambition video where he explains what he would do with the 25 grand. I have been kayaking for about 10 years and I always wanted to be able to paddle independently. If I win the Holman Prize I will equip my kayak with high and low tech devices that will enable me to navigate the kayak by myself. My dream is to be the first blind person to paddle from Europe to Asia by crossing the Bosporus Straits. Exactly what is required for someone to non visually, independently navigate their way through the Bosporus Straits from Europe to Asia? The kayak I’m going to use has kind of like fins going down from the bottom of the kayak kind of like penguin feet. And so you can pedal with your feet if you want or you can just do a classical paddle strokes. I want to keep my hands free because I’m going to use whole bunch of different technologies. No surprise here the technology includes an iPhone. I’m going to use a G.P.S. app – Ariadni G.P.S. You can mark way points and it will let you know when you get close to that way point. It also has a compass with degrees and tell you how far you are from your way points. And then I have a talking audible compass. Similar thing it will tell you degrees and you will set you course before you start and it will tell you if you are off course. Is that a separate device or is that an app? I will also have parking sensors or security cameras sensors. Probably the same thing they use when the cars park themselves… right? Right, right right! You know when you’re backing out so if you are about to hit something it beeps. I have a depth whisperer. D E P T H?. Ok at first I thought you said death (laughs) I was like I don’t like that one! It tell you if there’s shallow water underneath the kayak. If you are about to hit a rock or something . Ahmet does have to prepare for all scenarios. There’s redundancy in his technology so if one device fails another can provide the same or just as useful information. I’m just one of those people that like to tinker with things. It was developed to allow blind people to get a kayak and race it in a straight line and then turn around and come back. Reading about this device, Ahmet reached out to Marty who decided to expand on the original design. Now we’re working on something that not only includes a compass but gyroscopes, accelerometers, and three different axis. So you get a lot better information as far as movement and heading. We’ve got a G.P.S. module that’s it’s married to along with Bluetooth. That’s going to be interfaced with a device Ahmet will be able to wear on his life vest that will have some buttons that either he can program in some coordinates or commands to the system that he’ll just wear a headset and it’ll talk to him. It’ll tell him that in order to get from where he is to his next way point he needs to row in a certain heading direction. And if he gets off course the system will tell him to paddle more on the left or paddle more on the right. And when he gets to a way point it will let him know and then he needs to change his heading to another course direction and then it’ll tell him that. With both equipment and technology accounted for, Ahmet needs a few more things to be fully prepared to reach his goal; first a plan..
Istanbul is a city on both continents. And we have this Bosporus Strait that separates the city into two different parts. And the area I’m going to cross is about three, three and a half miles which is not a big physical challenge, but it has heavy traffic. These tankers are the size of multiple football fields. A small kayak would probably go unnoticed anywhere near such a large vessel. And getting out of the way even if you could see it would be virtually impossible. I don’t want to take my chance with those guys! The Bosporus being such a very narrow waterway. Authorities closely control the traffic flow in each direction. I will listen to the traffic channel. Usually they have half an hour or forty-five minute break in between and I will do my crossing during that time. Do you have to schedule this? Well, I talked to the Coast Guard in Turkey and they .. first they didn’t believe that I could do it and I showed my videos to them and they said ok do whatever, we don’t take any responsibility. There will be a really fast boat watching me from the shore. If something goes wrong they will come and pick me up in like few minutes. I’m not worried about the physical challenge – I can paddle you know three miles right now, no big deal. Being an expert using the technology if the key because I don’t want to have hesitation right in the middle of the shipping channel you know. That could be fatal. Why are you doing this man? I always loved the water, it’s my happy place. It’s the place I feel good about myself I feel free. I grew up in a fishing boat when I was a kid. My father was a fisherman. In the fishing boats I used to ask my Dad, you know can I steer the boat. he said yeh, you know, it’s water there’s nothing around you, it’s like miles and miles of open water. I used to take the steering wheel and just feel like I was the captain of the boat. And I was imagining like how can do something like this as a blind person as a blind kid. I always wanted to do something water related but my option were very limited in college. If I grew up in the US I would have probably do something like marine biology. I love what I am doing right now, I’m teaching special ed. It was always somewhere in my mind to do something water related and being able to do it independently. I have been thinking about it for a long time and I thought you know, it’s doable if I have the financial support I can do it. I believe him. And I will admit it, partially because he is a fellow Retinoblastoma Survivor but mainly because he began as a child. Ride a bike… tie hooks on a fishing line… avoid Sting Rays when you are swimming. Then becoming his own advocate at such a young age and showing such determination to get an education. I imagine these are some of the qualities seen by the Holman Prize judges who awarded Ahmet the 25 thousand dollars to complete his objective. You know, I’m not saving the world or I’m not creating job opportunities or changing the lives of blind people , but I think I’m doing something cool! At least it might encourage younger kids to try new things. I see that my students, high school kids, they get discouraged in terms of finding alternative ways… I think it will help. It’s cool, you focus on kids, you’re a teacher so that’s what you do, but for anyone, you’re pursuing your passion and that’s something that we forget in life. To be able to say you’re going to go and pursue your passion and have a dream and do it that is a universal thing that goes way beyond any sort of disability. There are people who are perfectly sighted, physical abled who are not pursuing their passion and we can all learn from that. Absolutely, yeh, I mean you know, it’s not a blind or sighted thing. It’s just I think being adventurous and take a risk take a chance. That’s probably the final ingredient necessary to complete this mission. courage! As a young boy on the fishing boat with his Dad, Ahmet dreamt of becoming the captain. It takes real courage to go for your dreams. I’d say Ahmet’s been captain of his ship for quite some time. If you’re interested in wishing Ahmet safe travels or want to follow his progress, go and Like his Facebook page; Ahmet The Blind captain. Being affected by the lack of accessibility is frustrating. Especially when you know the so called limitation isn’t real. a solution isn’t sought well, that’s intentional. Companies usually fall back on the cost and yes there could be a cost to updating a product, but there’s no real cost to changing how we think and design for the future. Inaccessibility is frustrating when you know that the reason for technology is to make our lives better. That was one of the reasons I wanted to reach out to Marty Stone, the developer creating an enhanced device to help Ahmet stay the course. You can never accuse me of being an optimistic person I’m afraid, but I do hope that we can save the world with science, I really do. The world needs a lot of help and a lot of people really don’t trust science or scientist it’s kind of shameful. This is what technology is all about. Absolutely, the stuff I do for AT&T is great and all that but doing this other stuff… this is the best stuff in the world. Volunteering and doing this other work. Taking some of that Geek ology and helping other people’s lives.. make them better. Man that’s just the dandiest thing in the world. We need more of a bridge between the users of technology and the programmers, engineers, scientists … nerds. It’s cool to be a nerd now, yeh…. laughs. The opportunity to profile Ahmet and his story came at the right time for me personally. For the past few years, September has been a pretty busy time here on the Reid Compound. As a survivor and a family impacted by Retinoblastoma, my family and I have spent the past few years telling stories to bring awareness of this childhood cancer. September is childhood cancer awareness month. This year unfortunately we couldn’t produce the stories so being able to bring you Ahmet and drop a little info about this eye cancer means a lot to me personally. In fact, I’d encourage you to check out some of the prior videos we have produced and see how the cancer impacted their lives. While these are videos the visuals included are enhancements, the story is told verbally. I’ll have some links on this episode’s post on ReidMyMind.com. I’m always hopeful that a story like Ahmet’s when presented in the mainstream media is done the right way. By that I mean, find and convey his message to the wider audience. In addition to the accessibility and self-advocacy I’m always personally encouraged when I see others going for their dream. That’s another take away for me, be prepared for that opportunity. Begin moving towards your dream. I hope the Holman Prize winners; Ahmet and Penny are encouraging you the listener to go for your dream if you’re not already. the final Holman Prize winner. Don’t miss it. Posted by T.Reid	on Sep 27th, 2017	and is filed under Access Technology, Accessibility, Advocacy, Audio, Blind Tech, Blindness, Family, Goals, PWD, Retinoblastoma, Sports, Swimming.